For many people, blogging is a solo effort; an exercise in self-expression. But if you’re considering blogging for a business or organization (like our Mayo Clinic News Blog or Podcast Blog, or a global university like SMUG 😉 ) you probably don’t want to have the entire responsibility resting on one person. You’ll want to get multiple contributors involved. One way to significantly increase the number of voices represented in your company blog is to, well…capture their voices. And their pictures. Using a video camera. Like the Flip. That’s going to be covered in Blogging 130: Video Blogging. WordPress (and its hosted service, wordpress.com) is ideally suited to enable lots of people to contribute text for a blog, while still enabling the blog manager (or the management group), to exercise final control. Contributors can write posts, but they don’t have authority to hit the “Publish” button. When they are finished, their posts are in the “Pending Review” status, until a higher-level user reviews and approves for publishing. If you were to use WordPress to publish and online newspaper/newsblog, for instance, and wanted to maintain an editorial process that would have articles go through review by an editor, you could have most of your “reporters” be Contributors, so that it would be impossible for one of their posts to be published without that review. Associate Professors at SMUG are in the Contributor role. Authors have the authority to publish a post and upload files, and can edit their own posts…but not anyone else’s. They can also save their posts as “Pending Review” but if you want to have that two-step process, you should have most users be Contributors. As an author, someone will inevitably hit “Publish” instead of “Save” and have a post published before it has been reviewed. But if you have a blog in which all of the authors are relatively equal and its just a forum for them to publish their thoughts, Author level access is appropriate. Editors have access to publish, edit or delete any post, page or comment. They can do almost everything an Administrator can do in terms of the day-to-day blog operation, but they can’t add or remove users, for instance. Administrators have complete control over the blog, including the ability to delete it. When you start your own wordpress.com blog you become its administrator. 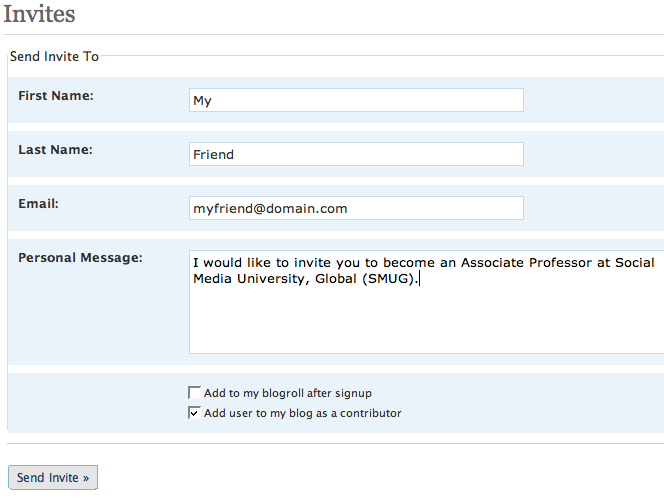 But you could add me or any other wordpress.com user as a contributor, author or editor. And if you want to become a SMUG Associate Professor, I can add you. If that address already belongs to a WordPress.com user, he or she will be added in the role you specify. If not, you’ll be prompted to send an invitation for that person to create a wordpress.com account. It’s that simple. And on WordPress.com, it’s free. On Typepad, you have to pay at least $149.50 a year for similar functionality. The WordPress.com FAQ offers some further illumination on user roles. If you haven’t started your WordPress.com blog, do it today. Then, if you need or want to have multiple contributors, go through the steps above to add them. If you would like to become a SMUG Associate Professor, leave a comment below, and I will add you as a Contributor. It’s been rewarding over the last several months to see the number of “students” at Social Media University, Global climb to more than 150, and to have so many countries represented, literally putting the “Global” in SMUG. Another goal has been to get more “faculty” members, and to have “associate professors” with experience in different areas contributing their expertise. That’s why I’m so excited to have Jan Husdal providing the Blogging 107: Typepad Pros and Cons course. An added bonus is that he’s from Norway, so now we also have two continents represented among the faculty. I have appreciated learning from Jan through his Typepad vs. WordPress blog; he’s responsible for helping me find out how to add the social sharing buttons you see on some of the newer posts here. I know you will find his posts helpful, too. If you see any of the courses in the proposed curriculum that you would like to write, or if you have ideas for class offerings that you think would be helpful and interesting to others, please get in touch with me through the e-mail you see in the Contact the Chancellor sidebar. Chancellor’s Note: This post was written by Associate Professor Jan Husdal, the newest addition to the SMUG Faculty. Please join me in thanking him for this contribution, and also check out his excellent Typepad vs. WordPress blog. For someone setting out to become a blogger, choosing the right platform is important. Once chosen, it is very difficult to reverse to a different platform. Not because it is not possible (since in most cases it is possible to fully export and import posts between blogging platform), but because every platform works differently and you get used to doing your blogging in a certain way. Apart from that, different blogging platforms cater to different audiences, so it is important to choose the platform that suits your needs. So, what are the disadvantages and advantages of choosing TypePad for blogging? An interface that is easy to use and understand. The TypePad user interface is intuitively set up an easy to use. I had no problems finding out where which function was. The ability to add scripts. This allows you add or embed practically any desirable widget you want, since most widgets are scripted. This means that TypePad can easily be integrated with other services. The ability to customize your blog theme. This is possible from The Plus level and up. For more information, see this post: How to build a TypePad theme from scratch. A wide selection of themes. TypePad has some 200+ themes to choose from and they keep adding new themes all the time. Unlimited number of Photo albums. TypePad is the only blogging platform that has integrated photo albums. Not the best I’ve seen, but it beats Flickr or other services. TypePad costs money. Their Basic account starts at $4.95/mo and although that may not seem like much, you can get a lot more functionality for free in WordPress or Blogger. The Plus level, which is the minimum I recommend for TypePad, comes at $8.95/mo. The Pro account at $14.95/mo gives you full control over your themes CSS and HTML templates, but as the name suggests, it is better left to the “pros”. Very few integrated widgets. Although the upside to TypePad is that you can install any widget you like, the downside is that you need to hunt for it yourself. Many of these widgets come in free ad-based and paid ad-free versions. That adds even more costs to your Typepad blog. On a side note, in my opinion any blogging platform should come with an integrated search form, contact form and default Error 404 page. Only WordPress does that. Limited number of blogs in one account. If you want to create more than one blog, you need to Plus account. If you want more than three, then you need the Pro account. TypePad is a blogging platform that is easy and straightforward to use, and it has a vast selection of themes to choose from. It is fully customizable and also allows commercial content, which means that you can make money with your blog. But, TypePad comes at a cost, and there are free systems, like WordPress, that offer more functionality for free. Here is a post I’ve written that hightlights some of the major differences between TypePad and WordPress: wordpress.com – not for serious bloggers? Many of the WordPress “pros” in the post are at the same time TypePad “cons,” adding to the above. It doesn’t surprise me at all that U.S. unique visitors to WordPress.com have roughly tripled in the last year to 20.9 million per month, while Typepad.com has only increased about 20 percent to 7.2 million. The two platforms were roughly equal a year ago. But what wasn’t equal was the value proposition. WordPress.com offers 3 gigabytes of free storage and unlimited bandwidth, and for $45 a year you can customize the CSS, buy an extra 5 gigs of storage (and the ability to upload mp3 files so you can host podcasts), and map your blog to a domain or subdomain of your choosing. You’d have to spend at least $299 a year on Typepad.com for anything approaching this functionality. And the cheapest, entry-level package price on Typepad.com is $49.50 a year. With Typepad you can get a two-week free trial, but with WordPress.com you can blog for free almost indefinitely. And even with upgrades that would give most people as much functionality and capacity as they could possibly need, the cost for WordPress.com is still less that that for the stripped-down version of Typepad. It all adds up to powerful incentives for new bloggers to start with WordPress.com, because all it costs them is their time to learn. And that doesn’t even take into account the free, open source WordPress.org software you can download and install on another server for even more functionality.